Casey Combest Injured in His Comeback Attempt The great white hope reportedly suffered a hamstring injury after getting off to a blistering start. 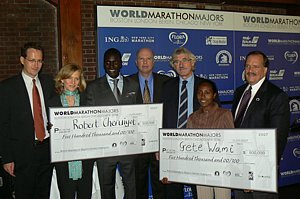 Dallas White Rock: James Koskei Wins Wellstone White Rock Marathon in Dallas And Gets $35,000 for a 2:15 Koskei is a Kimbia athlete who had tried to run Chicago. Mushir Salem Jawher is Now Leonard Mucheru Once Again And you guys act like we're racists when we call him Mucheru. 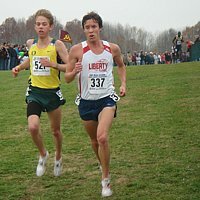 2007 NCAA XC Contest Recap: We Have a Repeat Winner Tim Goldsack is a genius. He won our 2004 NCAA XC contest and he won our team contest this time as well. Super impressive and so was the guy who picked the top 4 men, the top 2 women and the top 3 women's teams and top 2 men's teams perfectly. Plus we give props to another female winner who we have screwed over for 3 years. Adidas Trying to Compare Tyson Gay to Jesse Owens How about waiting until after the Olympics for the comparisons. 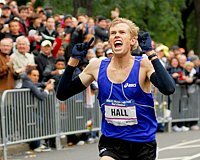 On the boards: Are ther any NFL guys that could go sub 10 in the 2 mile?